Weak, dated, and lean on decent action to boot. ...Burn Up W, minus budget and quality. Meet Maki, Reimi and Yuka: Three cops with something of a reputation for... well, using heavy weapons in the pursuit of criminals. When cute little Yuka gets herself kidnapped by a slavery ring, the remaining two of the trio are going to break out the military-grade weaponry to get her back. Burn Up! is, as you might expect, the predecessor to Burn Up W. While I can see the potential for a decent remake/sequel (as far as the comedy/action girls with guns sort of thing goes), it really doesn't come with that much to recommend it. The characters are predictable--the cute one, the violent one, the techie--as is the plot: the cute one gets kidnapped by the evil slavers and the others have to go rogue and single-handedly take out the bad guys. 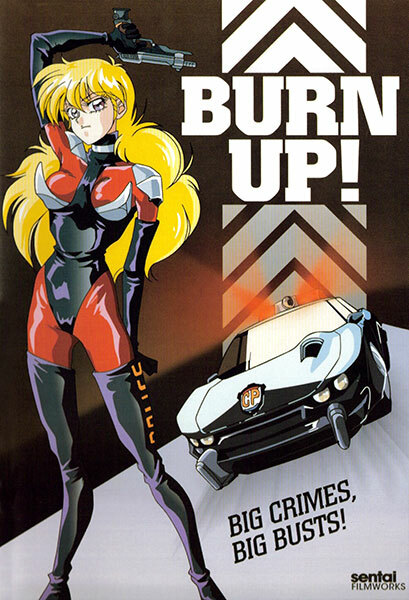 Other than being short, shallow, and not particularly attractive (the art and animation are dated and uninspired), Burn Up also has less action (or less good action, at least) than I would expect to see in a one-off like this, and certainly less than I wanted to. 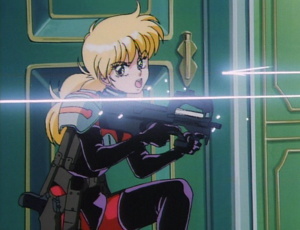 Pretty much the only good parts--parts, that is, that pull off the sort of light-hearted violence that makes things like the Dirty Pair enjoyable--are a short action scene at the beginning, and some of the climactic battle at the end. I'll go ahead and give away the only really good bit, since it's not worth watching the whole thing for: A bad guy accidentally shoots the meek techie's gadget, and she goes berserk with an automatic weapon (and rocket grenades) in revenge. Fun, and if that fifteen seconds sounds like it's worth sitting through the rest of the hour for, go for it. Otherwise, this is yet another girls with guns show, and one that falls way into the sub-average end of the spectrum at that. 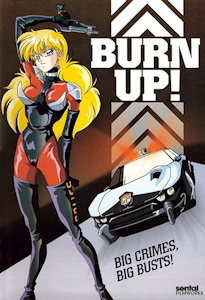 Burn up was one of ADV's earliest releases. Available in North America from Sentai Filmworks on bilingual DVD. Was previously available in a similar DVD from ADV; ADV had originally released it on subtitled and dubbed VHS, one of their first releases. Burn Up! is Copyright © 1991 NCS / MRC / AIC. Any images are the property of their respective rightsholders, and included for review purposes only under the fair-use clause of US copyright law.